Echoing the words of Maldivian President Mohamed Nasheed (We will not die quietly!) and the African negotiator Ambassador Lumumba, (No to climate colonialism!) hundreds of youth created a loud and energetic "climate storm" today inside the Copenhagen climate talks at the UN. It was the largest demonstration at COP15 yet -- and was just a taste of the storm to come. Youth from every continent clapped, snapped, and pounded their feet to make the sounds of a rainstorm in a representation of the typhoons and hurricanes that have ravaged communities around the world this year. "Negotiators are turning their backs on us and telling us to keep quiet. As a young person living in the Pacific, I know what it's like to fear climate change," said Subhashni Raj, a youth organizer from Fiji who spoke at the rally. "I'm here to say that we will not die quietly." Responding to growing calls from African, Island Nation and Developing Country delegates for real justice, today's storm was an effort to link the plight of G77 countries to the debt they are owed by the global North. The over 1,000 youth participating in the talks ­-- the largest youth delegation in COP history -- have consistently refused talk of political compromises that amount to "suicide pacts" for many low-lying nations around the world that would be destroyed by unchecked climate change. Youth are specifically calling on developed countries to step up their emissions reductions commitments and to cease the secret, back-room dealing that has plagued the talks. "Yesterday, in a meeting with African civil society groups, Ambassador Lumumba made it clear that African countries will refuse to sign a suicide pact here in Copenhagen," said Landry Ninteretse, a youth organizer from Burundi. "European and American aid proposals look more like colonialism than an attempt to solve climate change. Our hopes and dreams can¹t be bought off $10 billion dollars." Those of us in the North have colonized more than our share of the atmosphere, and it will be impossible to reach a deal without a serious commitment to repaying our climate debt. 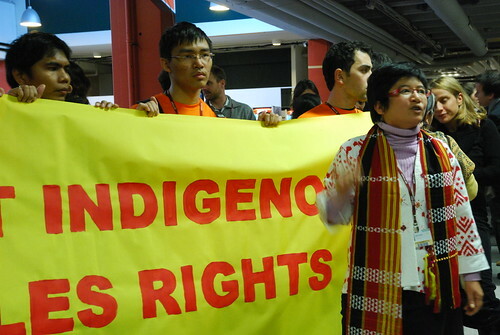 Immediately afterward, Indigenous people inside the UN formed a human chain to demand much stronger safeguards for Indigenous Rights within the treaty. Today is human rights day, and it was a celebration in style. With youth support, Indigenous people led this spontaneous demonstration which became a march throughout the Bella Center. Chants such as "NO RIGHTS, NO REDD!" echoed throughout the building. This is just a taste of what is to come in the weeks that are unfolding here in Copenhagen. The protests today signify just another escalation of international activists inside the climate negotiations.